I eagerly await each book in the space opera Vorkosigan series. 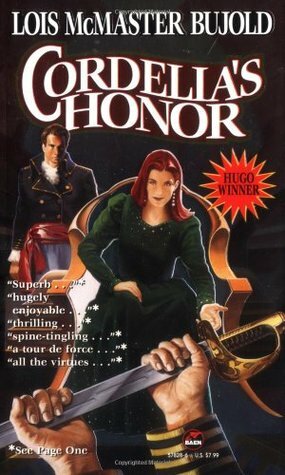 Lois McMaster Bujold is a master plotter, good with the twist, great at crafting political intrigue. She excels at enabling the little guy to triumph, and at creating clever characters who outwit better equipped opponents. Cordelia’s Honor is an omnibus composed of two books: Shards of Honor and Barrayar. Together, the books follow the story of Cordelia Vorkosigan (Naismith) from the time she meets her enemy and eventual husband Lord Aral Vorkosigan, to when she gives birth to eventual series hero, physically flawed but brilliant son, Miles. In these books, space captain Cordelia falls in love with an aristocrat from a militaristic planet where she must fight to survive. And fight she does! Fantastic heroine. Her son is a great hero in later books. Barrayar won the Hugo Award for the best science fiction novel of the year in 1992, and the award was richly deserved!